Feeding an aquarium seems simple enough. Buy a jar of flake food, and toss some in, right? Actually, that really isn’t a good idea for a variety of reasons. Hopefully you’ll find the following information helpful for your own specific needs. Foods come in many forms, including sheets, flakes, pellets, frozen, refrigerated, liquid, and live. Flake food is convenient, easy to dose, and relatively inexpensive. A few things to keep in mind are that it should be kept in a cool dry place, not sitting on the canopy where the heat of your lighting can ruin it. Never pour the food into your tank, as an accident may occur which will dump excessive amounts of flake food into the water polluting the tank. It is better to take a pinch of food, and submerge your fingers in the water while releasing the food in the current. 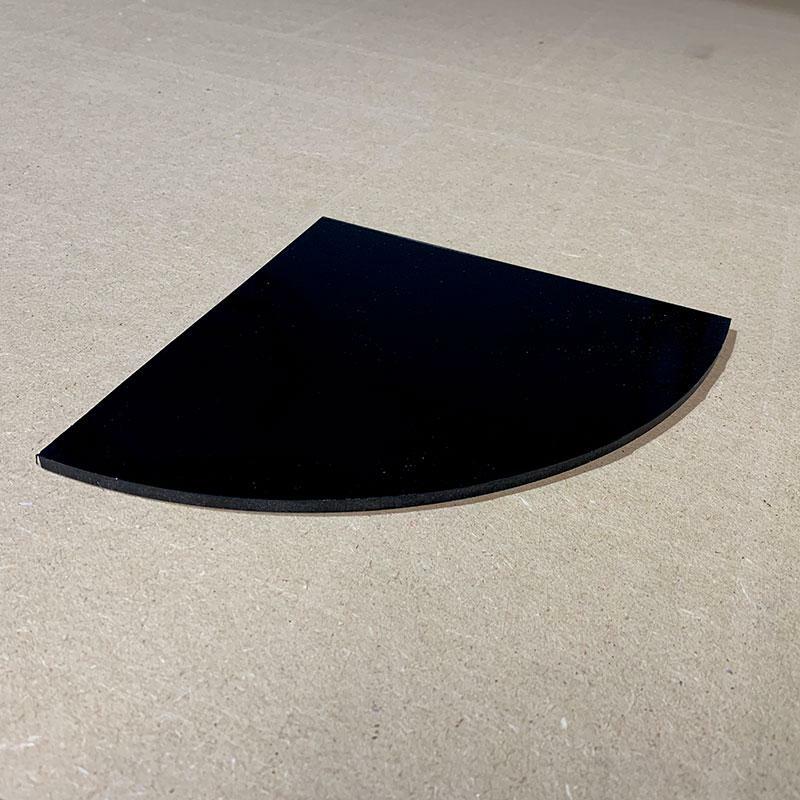 This will allow your fish to eat without gulping down air trying to eat from the surface. Keep in mind that flake foods are known to add to phosphate issues, so if your tank suffers from nuisance algae, it would be better to reduce the amount of flake food feedings. *Please note there are a variety of types of flake food being made by companies such as Cyclop-Eeze and Brine Shrimp Direct that may be more nutritious than the more common kinds off the shelf. Pellet food comes in various sizes. Most smaller fish will not eat large or even medium sized pellets, so I buy small pellet foods like Formula One and Formula Two. Pellet food tends to sink but it would still be a good habit to submerge your fingers when feeding to prevent some from floating. 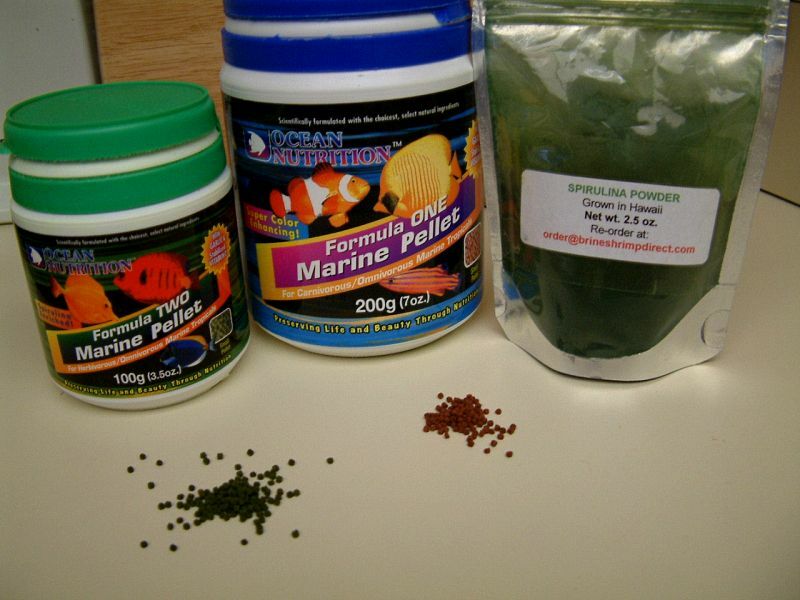 Pellets can be used to feed LPS corals, fish, and even your refugium. I’ve observed all kinds of creatures eat pellet food, such as bristleworms and even my mandarins. Avoid overdosing your tank with pellets, as these can end up polluting the water. Again, don’t pour it into your tank or set it on the edge as you may dump the container into the water accidentally. 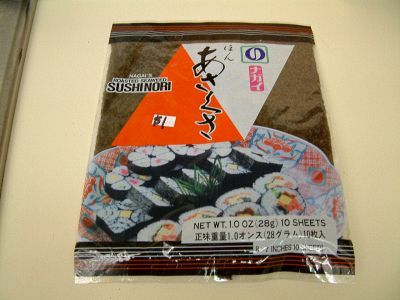 Sheet algae, referred to as Nori, is an excellent method for feeding herbivores such as tangs. Using a feeding clip, you can affix Nori to the glass and your fish can chew off small pieces over a period of time. If you are keeping tangs, please be aware that these fish graze all day long and don’t do well only being fed once a day. Clipping on some Nori in the morning and then feeding again in the evening tends to result in healthy plump tangs. Fresh foods, available at your local grocery store, asian market or fish market can be useful as well as varied. 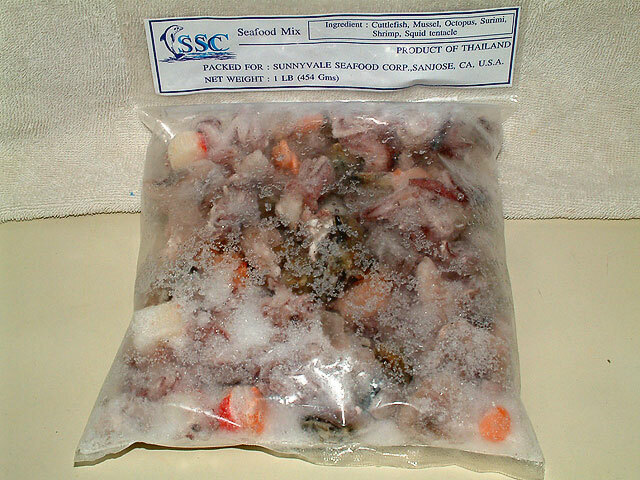 When shopping, buy saltwater-based product, such as squid, octopus, scallops, shrimp, clams and more. It is not recommended to use freshwater-based livestock as food for saltwater species. If you have doubts, consult your local club or ask online before you make what could be a fatal mistake. Fresh food should be thorougly washed, and be specific and ask if the food has any preservatives or if it has been pre-cooked. If either of these have occured, it would be wise to pass on that selection. Here is my home-made frozen food recipe. Other fresh foods others have used are broccoli, romaine lettuce, and orange slices. Each of these contains vitamins that may be beneficial to some herbivorous fish, but is not found in the ocean. Be sure to wash these foods well to remove any pesticides that may poison your fish. Some are using broccoli to feed tangs, and blanch the florets in boiling water for 15 to 20 seconds to kill any parasites before offering this now-tender food to their fish. Fresh vegetables can be secured to a piece of rock with rubber bands or clipped to the glass with a food clip. Frozen foods are always available at your local fish store (LFS). 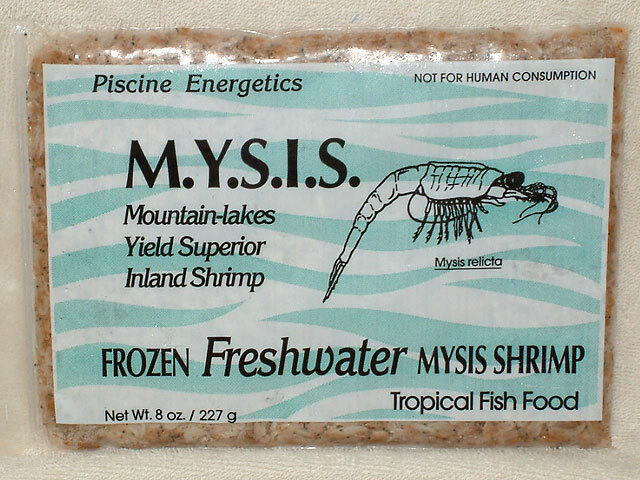 You can buy frozen brine shrimp, bloodworms, mysis, squid, scallops, krill, silversides, plankton and more. Some are sold in bars; others are sold in bubble packs where a cube can be used one by one. If you purchase Formula One and Formula Two, using one cube of each would provide some meaty food and some vegetable-based food to your livestock. Even though it comes in a cube doesn’t mean you have to use all of it that session. Cutting it in half, for example, allows you to tailor the amount of food being used. 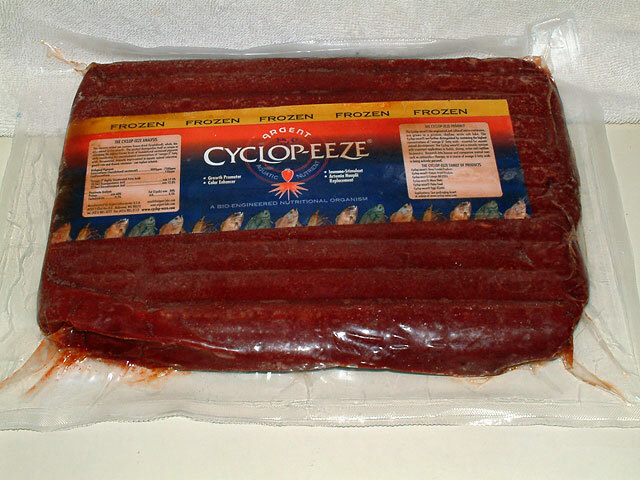 Cyclop-Eeze in frozen form is highly regarded food strong in HUFA fatty acids that fish need, and they love it. When purchasing frozen foods, consider what fish & corals you have, buying what they usually get in nature if possible. Krill, silversides and shrimp are all meaty foods that are used to feed anemones, eels, some LPS corals and even certain fish. Keeping some in the freezer guarantees that you’ll have food on hand when you need it. 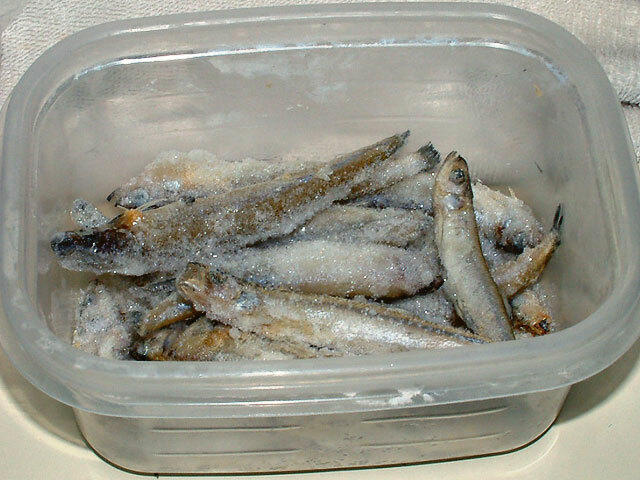 Frozen foods should be thawed prior to being added to the tank, and is easily dissolved if left in a small dish filled with some tank water. Within 10 to 15 minutes it is ready to use. Frozen foods should never be left out on the counter, and if discovered later to be fully thawed or even room temperature, it would be best to dispose of it rather than risk poisoning your livestock. I wouldn’t risk it myself, and neither should you. Liquid foods are available and usually designed to feed filter feeders such as sponges and feather dusters. However, in recent years various plankton-based foods have come to market allow us to target corals, fish fry, as well as the pods in our system. LiquidLife BioPlankton and CoralPlankton is one such food that is kept in the freezer and yet stays in liquid form and can be fed to the tank late at night when coral polyp extension is at its greatest. Knowing your system’s total volume of water is very important because that is how you’ll determine how much food to dose. Too much will pollute the system, and not enough will prove ineffective with poor results. 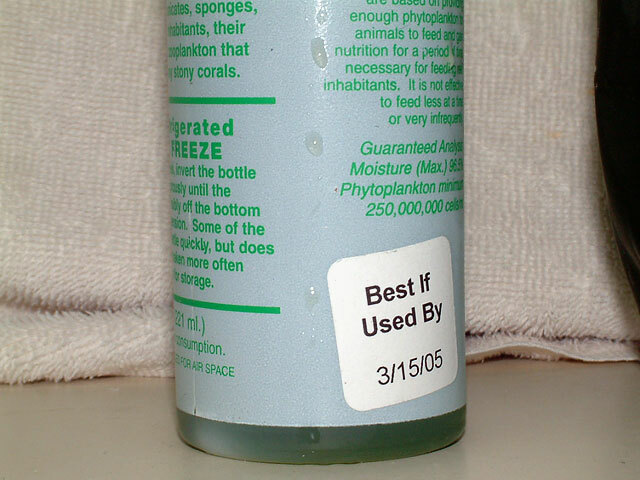 Another liquid food used is Phytoplankton, whether it is purchased at the LFS or homegrown by the hobbyist. Phytoplankton has made my soft corals perk up, and micro-fauna in our tanks feed upon it. When buying it, be sure to check the expiration date, and smell it for freshness. If it smells spoiled, it is. Dosing it every other day is sufficient, and will result in good pod growth in your reef for some fish such as wrasses and mandarins to feed upon. When feeding phytoplankton, I’ve always turned off the protein skimmer for an hour to keep the food in the water longer. 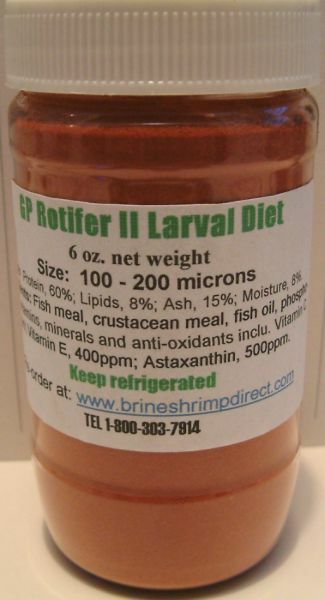 Live foods may be bloodworms, brine shrimp, ghost shrimp, rotifers and small feeder fish. Some fish need live food at least at first, and some demand it as long as they live. Ghost shrimp can be released in a tank for a Lion Fish to consume, as it gets hungry. Newly hatched brine shrimp can be fed to dwarf seahorses. Rotifers are fed late at night for SPS corals to consume, and for newly hatched clown fish fry. Hatching brine shrimp is quite simple, and offering newly hatched baby brine shrimp to your livestock can be quite nutritious as the yolk sac is still attached at that point. If you feed the baby brine shrimp some phytoplankton six hours before you harvest them, they will be ‘gut-loaded’ and provide even more nutrition to your reef. Powdered foods such as Golden Pearls or ZoPlan can be used to feed livestock food in microscopic increments. One thing to know is that you can overfeed with these foods, causing massive algae outbreaks or making your skimmer overflow relentlessly. Both of these things have happened to me, so use these foods judiciously. If you have a tiny measuring spoon from a Salifert test kit, know that one tiny spoonful of Golden Pearls is plenty for a fully stocked 55g reef tank. Three little spoons may result in cyano bacteria for three weeks! Oops. Vitamins benefit your livestock, and one herb mostly recommended is garlic. A few drops of liquid garlic oil are all that is needed, soaking into the food for 10 minutes. It stimulates a response in the fish to eat, and seems to boost their immune system. Selcon is very high in HUFA’s and available at many LFS. Spirulina powder is another good vitamin-based powder that you can add to their food. Vitamin C has been used with good results, by simply rubber banding a wedge of an orange or broccoli floret to a rock in the tank for the fish to nibble upon. Other vitamins are recommended for fish that are sick or malnourished. Always wash your hands well before feeding your tank, rinsing your hands well to remove all traces of soap, lotions and meds. Don’t touch anything other than the food and your tank – don’t pet your dog on the way to the tank! Never feed directly from the container. Put the necessary amount in a small plastic container to avoid accidentally dropping in too much or spoiling the rest of the food by getting it wet. Always thaw your food before feeding it to the tank. Don’t overfeed. The food should all be consumed within 5 minutes of being added. Your tank water should not change colors typically, unless it is a product designed to cloud the water (Roti-Rich, for example). Target-feed livestock at the right time of day or night. Anemones are easier to feed at night because the fish are at rest. Feed them small chunks of meaty foods, nothing larger than a lima bean. Anemones should not have to expel waste (a blob of slimed food) if they are fed properly every 3 days. Too much food will simply be rejected, so why do it? Use a feeding dome for corals that need time to eat. Open brain corals, candy cane, hammer and frogspawn can all eat meaty foods, but need time before nocturnal creatures steal it away. Using nets or the top of a 2-liter bottle can work nicely. If you plan to leave the dome over the coral for more than one hour, drill small holes in it or cut slits so that current can flow through the feeding dome to avoid stagnated water / oxygen depravation. If you hatch brine shrimp, they should be captured via a brine shrimp net. The water that they hatched in should not be introduced into the tank, nor the egg casings. Turn off the pumps if you are target-feeding foods that you need to stay in place. If you want the food to flow through your entire tank, leave the pumps on. Turn off the return pump from the sump when you feed so the food stays in the display tank where your livestock is, rather than feeding the aptasia (glass anemones) in the overflow and sump. Set a timer or use an alarm as a reminder to turn the pump(s) back on one hour later. Phytoplankton should be fed every other day to avoid polluting the system. If you’ve never fed with it before, dose your tank in small amounts, increasing the amount slightly with each feeding until you reach the proper amount for your tank. This may take up to two weeks to reach that level, but in this way your bio-load will adjust and adapt to this feeding regime and keep things balanced. Phytoplankton feeds soft corals, feather dusters, and clams, as well as the pod population in your tank & refugium. Use a turkey baster to target feed with thawed mysis or similar foods. Always mix powdered foods in some RO water or tank water prior to pouring it into your tank. Pour it in slowly in an area of high flow. Pouring in quite a bit of food into your tank at one time usually assures that all your fish will get a meal vs. feeding in smaller amounts. The more active / aggressive fish will get the majority of the food and timid ones will miss out if you feed in tiny portions. Remove excess food found in your tank if uneaten after 5 or 10 minutes. When out of town, prepare servings in individually marked containers so your tank sitter won’t overfeed and pollute the water. Type up some written instructions for quick reference and reminders. Remember that a reef tank is a closed system and thus a delicate balance to be maintained. Whatever you put into the system will come out later, either through the fish, the protein skimmer or via nuisance algae. Try to determine the proper feeding regime for your tank, and adjust it as necessary. Posted 13 hours 19 min ago.